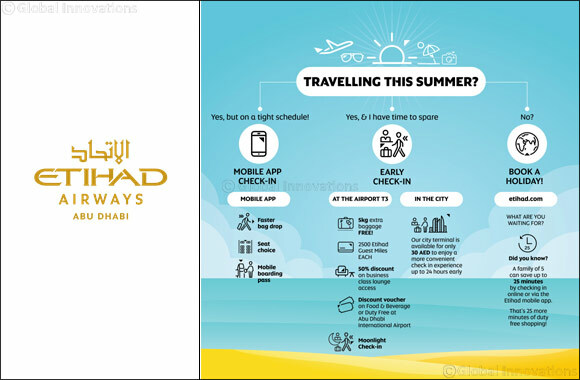 Dubai, UAE, June 26, 2018: The summer holidays are set to start soon with schools in the UAE breaking for holidays in the coming weeks, leading to a particularly busy time at Abu Dhabi Airport. Moonlight Check-in will be available for guests to check-in early at Abu Dhabi Airport. Guests using Etihad’s Moonlight Check-in will receive 2,500 Etihad Guest miles per guest, 5kg additional baggage per guest, as well as an Abu Dhabi Airports discount and offers voucher on Duty Free and Food & Beverage. Moonlight Check-in guests will have the option to purchase access to one of the Etihad Business Class lounges at Abu Dhabi Airport with a special 50% discount offer. Economy Class check-in for non-US flights opens three hours before departure and closes one hour before departure. Economy Class check-in for US flights opens five hours before departure and will close two hours before departure. Guests must also present themselves at the US Customs and Border Protection facility no later than 90 minutes before departure. Boarding for all Etihad Airways departures closes 20 minutes prior to departure for guests in all classes. For guests travelling with young children and infants, a dedicated ‘Family Check-in’ area will be available for flights checking-in at Terminal 3 each morning (6am-9am) between 27 June and 31 July. Extra Etihad Airways staff will be available on site to provide assistance, and additional signage and dedicated immigration access will ensure a seamless airport experience. The Etihad Airways website also has a variety of pre-purchase seating and upgrade options for greater comfort while travelling during the school holidays. The ‘Extra Legroom Seats’ offer a generous space for guests to stretch their legs, while the ‘Preferred Seating’ option allows guests to choose a seat nearer the exit or just somewhere more private. There is also the innovative ‘Neighbour-free Seat’ option for guests to choose. Instant upgrades to Business or First Class are also available for purchase at special rates during check-in for guests looking to travel in additional comfort.